So your corporate group is on the hunt for a fun and thrilling team building event. You start by browsing through our Top 10 Programs, and two programs catch your eye; Amazing Chase SmartHunt® and City SmartHunt®. Are these scavenger hunts? Are these team building? Well, you are on the right path as they are both a scavenger hunt type of team building! Remember when you were young, and you played games like manhunt, hide and seek, scavenger hunts or Easter egg hunts? Kids love them and so do adults! Introducing our high-tech team building scavenger hunts for corporate groups. 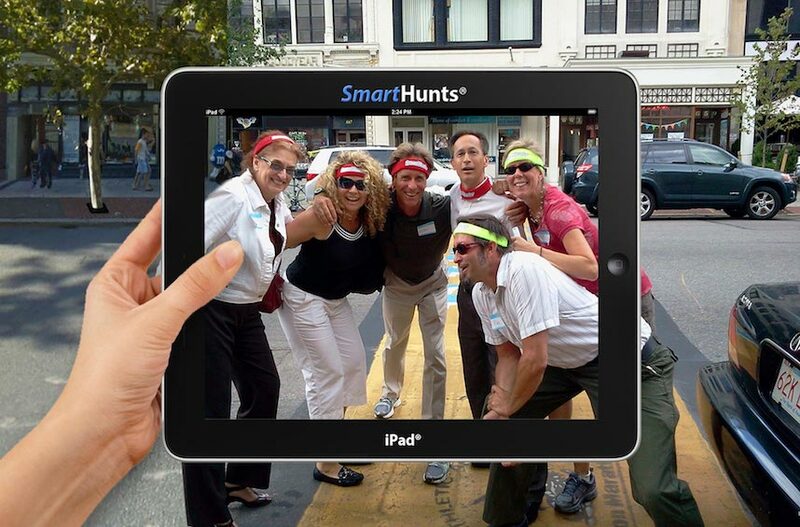 SmartHunts® are a unique combination of sightseeing, adventure, team building challenges and gamification fun your company will love! If your company is hosting their conference in a fun city, whether metropolitan, small and quaint or a beachside town, then a SmartHunt® is the perfect activity for your group to get out and explore their surrounding city while having fun. Your group will explore local landmarks, learn fun facts and we can even brand the event with your company logo. The SmartHunts® app allows us to customize the questions and content to your company including points of interest, photo, video, and trivia to meet the goals and outcomes for your group. Your group will start with an engaging physical icebreaker to form all the participants into teams. Each team is given an iPad loaded with our event app to get things started. Teams are now on the hunt, analyzing clues and navigating their way through the city. Teams will develop the best possible strategy to beat the other teams. Groups use their iPads to answer quizzes, tour points of interest, solve puzzles, and tackle photo and video missions during their hunt. Once all the challenges are complete, it’s a race against the other teams – and the clock – back to home base. Laughter, accomplishment, and fond memories are additional benefits to this event. Teams will improve trust, communication, and effective problem-solving skills. The hunt features two-way messaging. Teams are connected with our lead facilitator, stationed at the ending location, which tracks racers using GPS. The facilitator downloads photos, video, and scoring throughout the hunt for a big-screen presentation of the action during the event. Teams will never lose connectivity to their game. Een if the hunt takes them indoors. All photos, videos, and scoring are sent to us throughout the event. We will have them on the big screen when your teams arrive at the final location. After the program, we will also send you a link that contains all the photos and videos shot by your group. The page also includes an edited video plus all the scores, photos, and videos from each participating team. Now, that’s SMART! So if your group wants to explore a city, museum, or an attraction, our SmartHunts® location challenges will make sure your teams won’t miss a thing. Our national account managers will take the time to get to know you and your company walking through the details of your upcoming event. Our objective is to recommend the best team building program that will be right for your event whether it’s a SmartHunts® or something that’s customized just for you. SmartHunts® has been delivering professional corporate team building events since 2010. We have built a solid reputation by working hard to deliver top-quality programming for our clients. Learn more here.